Whether or not you know what to do with a stove, you need to eat. And, while food doesn’t have to taste good to be eaten, it certainly is nice if it does. As someone who enjoys eating, cooking, and science, today, I’m merging them all together! I hope I can convince you that there’s interesting science to be found in the kitchen. The skeletal (Kekulé) structure for capsaicin. This is where you can find capsaicin. 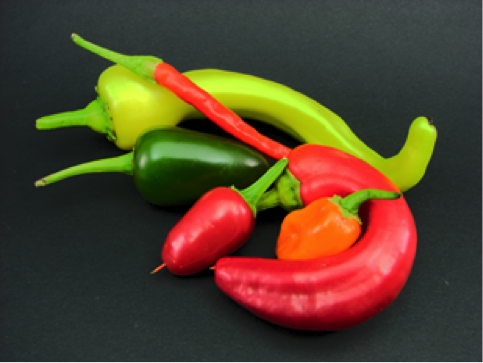 Peppers of the capsicum family: jalapeño, banana, cayenne, chili, and habanero. Credit: Wikipedia Commons. So, capsaicin and capsaicinoids are the primary molecules in spicy foods that give them their kick. But, why do some people like the sensation, and how can others beat the heat? It’s not clear-cut, but one theory connects the spice-induced pain response to the fight-or-flight instinct, which the human body instinctively prepares to deal with a threat. Since there’s no actual threat, spicy foods allow us to have a risk-free boost of adrenaline and other related brain chemicals. As for how to beat the heat? Capsaicin is fat- and oil-soluble, meaning that fat or oil-containing liquids – like milk! – can help wash it off of your receptors. Incidentally, understanding the nature of spice has found a use in pain-reduction in various diseases, such as viral and diabetic neuropathy as well as rheumatoid arthritis. Chronic exposure to capsaicin – or, the long-term consumption of spicy food – can result in desensitization of TRPV1 and related receptors, which prevents transmission of certain pain responses. Moving away from spice and towards sugar, let’s talk about caramelization. Caramel is a confection that has been made perhaps as early as 65 B.C, but for thousands of years, the underlying chemistry went unknown. Caramelization is one of the major methods of transforming sugars while cooking. The first studies of the caramelization process were performed in 1838 by the French chemist, Étienne Péligot. These initial investigations were fraught with difficulty: Péligot, and subsequent investigators of caramel were unable to clearly determine its chemical nature, unlike capsaicin. 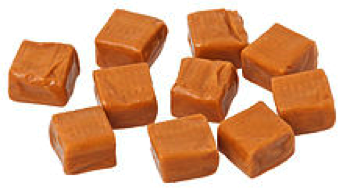 A detailed understanding of caramel wasn’t obtained until research in the 20th century by Jacques Defaye and José Manuel Garcia. It turns out that caramelization of sugars – even starting from say, pure sucrose – is a complex process that generates lots of different molecules! Sucrose is a sugar molecule, more specifically, a disaccharide. Glucose and fructose, which are monosaccharides, are “simple” sugars: they combine in a chemical reaction to form sucrose. During caramelization, complex oligosaccharides can form, where many different units of “simple” sugar units come together as distinct molecules. The complex mixture of molecules obtained during caramelization is why it was so hard to study! The caramelization of sucrose…kind of. Sucrose (on the left) breaks down and melts at high heats (~340°F) to glucose and fructose (middle), then forms into complex sugars. The scientific investigation of food is food science, and the art of applying to that science to cooking is called molecular gastronomy. Within them, there are many more interesting scientific aspects to cooking, like the Maillard reaction, which explains why meat and toast both turn a wonderful tasty brown when cooked nicely. There are also plenty of cooking adages that may or may not have a scientific basis: for example, people insist on salting boiling water before using it to cook. Why? Well, that’s enough for one post. I hope I’ve given you a taste for science, cooking, or both!